When you create a scene, it and its associated files are stored on one drive. If you find you are running out of space you can move a scene to another drive. However, you can consolidate all the scenes for a particular Job in a single directory allowing you to find related information quickly. You may also want to file your scenes in specific directories, creating a customized directory system. The Move command lets you move scene data from one file system to another. • Make sure no one else is currently using the scene's data. This ensures no one can open the data files while you move them. 2. In the top menu, select Scene > Move. You can also right-click anywhere in the Scenes list and select Move. 3. In the Select Scene(s) to Move field, select the scenes you want to move from their current directory. 4. 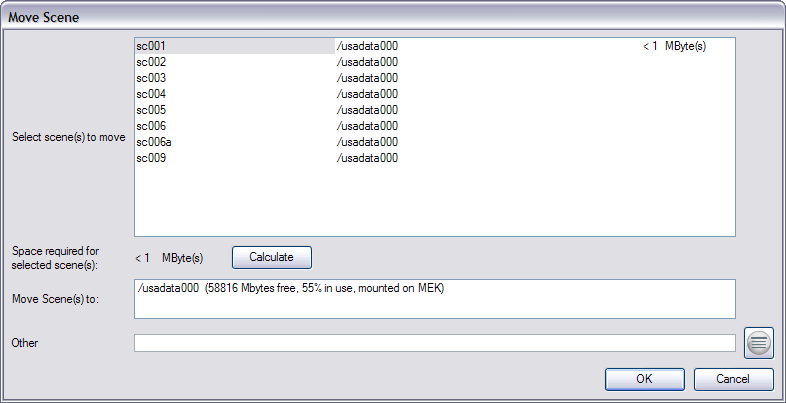 Click on the Calculate button to know how much hard disk space your selection requires. 5. In the Move Scenes To list, select the directory where you want to move the scene. If the directory to where you want to move the scenes does not appear in the list, in the Other field, enter the new directory path. The Control Center module automatically checks the amount of free space for each directory and compares it to the size of the scene you want to move. If there is not enough disk space on a particular drive/mount point to store the scene, the directory displays a not enough space message. If there is not enough space on a particular disk, you should choose another disk from the list.